Facebook ruled the Web last week just squeaking past Google to become the most popular online destination among United States users. For the week ending March 13, Facebook claimed 7.07 percent of U.S. Internet visits, while Google was right behind the social network with 7.03 percent, according to metrics firm Experian Hitwise. 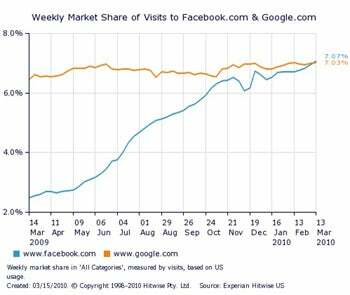 Compared to the same week in 2009, Facebook visits grew by 185 percent, while Google was comparatively stagnant with a mere 9 percent increase in visits. Facebook has been ranked as the number one online destination before, but this is the first time the social network has held that title for an entire week. During last year's holiday season, Facebook beat out Google on Christmas Eve, Christmas Day, and New Year's Day, Experian Hitwise says. The social network also took top site honors among U.S. visitors during the weekend of March 6 and 7. It's not clear why Facebook would have beat out Google during the recent March weekend, but one possible explanation for Facebook's holiday dominance is the desire for users to connect and share holiday experiences with loved ones and friends scattered across the country and the globe. Google is trying to counter the popularity of social networking sites with Google Buzz, a service designed to share content through your Gmail inbox. However, Google has run into problems with Buzz and has been heavily criticized for Buzz's poorly designed privacy controls. Some of these privacy concerns have been resolved, but it's not yet clear if Gmail users are adopting Buzz in sufficient numbers to impact competing social networks. No stranger to privacy concerns itself, Facebook continues to grow at a healthy pace, and now boasts more than 400 million members worldwide. The social network is also starting to become an integral part of the Web with its sign-in service Facebook Connect, which enables users to get around third-party Web site registration with just one click (a feature recently adopted by this blog). Google has a competing service called Google Friend Connect, but Facebook's alternative has been far more successful in terms of mainstream adoption. You can check out the blog All Facebook for a complete list of the major Web sites using Facebook Connect. Facebook is also reportedly getting ready to compete with location-based services, and is expected to unveil location-aware status updates and other location features in the near future. Despite Facebook's recent growth, however, I have to wonder if it will be able to beat out Google on a regular basis. Facebook may be the dominant social network in the U.S., but I doubt we've reached a point where it's more practical to turn to Facebook instead of Google as an important source of information. Well, not yet, anyway.